The "FLV" models listed here have manually-operated, counter-weighted doors that open vertically with the touch of a finger. Pneumatically-powered doors are optionally available. The large chamber sizes make these systems ideal for parts that are up to 30" tall and for parts, racks, or baskets that dry most effectively with downward air flow. 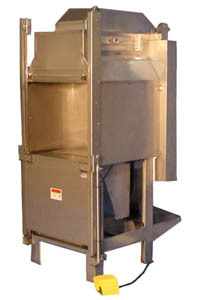 The front load dryers with horizontally-opening doors ("FLH" models) found here, have the same air flow pattern, but taller and narrower chambers. 30" x 24" x 30"
36" x 30 " x 30 "
48" x 32 " x 36 "
42" x 44" x 105 "
48" x 50 " x 105 "
60" x 52 " x 111"